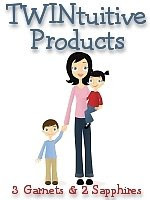 I chose this side-by-side stroller organizer to feature as a "TWINtuitive Product" because I personally prefer a side-by-side stroller over a front-back twin stroller. The main drawback with a side-by-side is that there is usually not a storage tray up by the handles. For this reason, many people do not opt for this type of stroller. 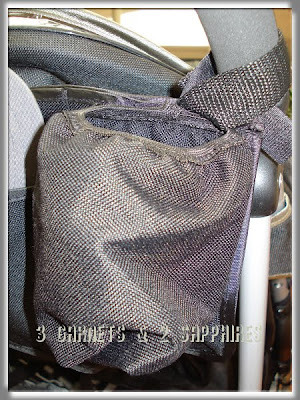 The Sicily Double Stroller Cup Holder is an affordable solution to this problem. 1) I was very impressed with the design, which was sturdy and allowed a custom fit to our stroller. The Velcro spans almost the full length of the three sets of straps (one for each handle and one for the center bar). 2) I like that the fabric is thick, strong, and water resistant. 3) I was very pleased to find out that the center pocket (located right below the Carry You label) is roomy enough to hold a large fountain drink. 4) The two cup holders at the ends are the perfect size for baby bottles, sippy cups, and 16oz bottled beverages. The tops are elasticized so it can keep cups with smaller circumferences in place. 5) It is extremely convenient that we do not need to remove the organizer before folding up the stroller. This Carry You product more than solved our problem. The Double Stroller Cup Holder actually has the capacity to hold much more than a regular stroller tray would. 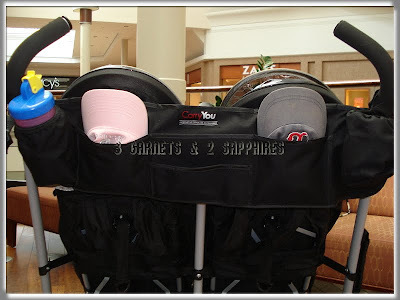 To view the full line of Carry You stroller accessories, visit CarryYou.com . Thank you to Carry You for providing us with both a review product and a contest prize free of charge. One lucky reader will receive a Sicily Double Stroller Cup Holder. Browse the selection of Carry You products. Then leave a comment telling me which product looks like it would be especially useful (other than the Sicily). You MUST do this to be eligible to win this contest. 4) For 10 extra entries, blog about this contest linking back to this post AND CarryYou.com . Then come back here and leave TEN separate comments with the link to your blog post.